Your hamster just isn't acting like himself lately. A wide assortment of different ailments can affect your hamster. If you believe he's sick, you need to have a qualified veterinarian who has experience working with hamsters examine your pet to determine what is wrong and how to treat him when he becomes ill.
Hamster diseases can range from the common cold to diabetes. If your hamster is sick his symptoms may include lethargy, weakness, listlessness, he may appear uninterested in life, have dull eyes, dandruff, fur loss, a runny nose, diarrhea, lumps, bumps or strange wounds. Hamsters can suffer from many of the same illnesses as human beings or other pets, including mange, strokes, cancer, tumors, bladder infections, kidney infections, fungus, worms, abscesses or go into shock due to an injury. It is absolutely essential to take your hamster to his veterinarian if you notice symptoms of illness. Hamsters are fairly fragile pets and can die quickly if an illness if left untreated. In many cases, your sick hamster is just as likely to die of dehydration caused by an illness as he is from the illness itself. Hamsters can become dehydrated very quickly, especially if they are suffering from diarrhea. Your veterinarian will probably supply your sick hamster with fluids that have been enhanced with vitamins and minerals as part of his treatment for almost any illness. Preventing dehydration is absolutely essential to making sure your hamster recovers from being sick. A dehydrated hamster may appear to be weak or lethargic, appear to have sunken eyes or dry mucous membranes. He may also have loose skin that tents when you pinch it rather that returning to its normal position. If your hamster is sick your first step is taking him to the vet. Your second step is turning your home into a safe, comfortable hamster hospital where he can recover. You need to separate your sick hamster from other pets. Clean and sterilize his cage, toys, exercise wheel and bowls. Throw away any items that can not be sterilized. Provide plenty of clean, fresh water and discuss what foods your hamster can have with your veterinarian. If your hamster is suffering from diarrhea you will need to be careful about what fresh fruits and veggies you feed him because some fresh foods can cause diarrhea. Keep your sick pet under close supervision but avoid handling him unless absolutely necessary. He needs a low stress, safe environment in which he can relax and recover. Wet tail, also known as transmissible ileal hyperplasia, is probably the most commonly recognized hamster illness as well as one of the most serious. 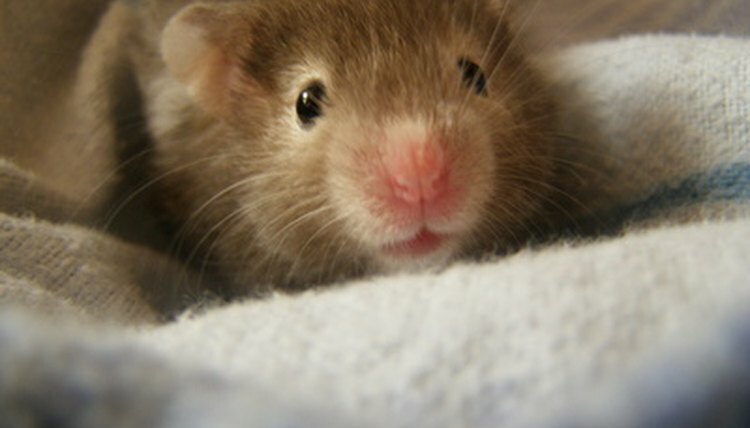 It primarily affects Syrian hamsters though dwarf breeds can come down with the condition. Wet tail is often brought on by stress and commonly occurs in hamsters who have been recently weaned, have experienced a significant change in their environment, live in an overcrowded or dirty environment or are suffering from poor nutrition. Symptoms of wet tail include lethargy and severe diarrhea that can cause the tail to appear wet. Wet tail is contagious and often fatal. It can be treated with fluids and antibiotics but the success of treatment varies greatly. Your hamster should be rushed to the veterinarian at the first sign of wet tail.